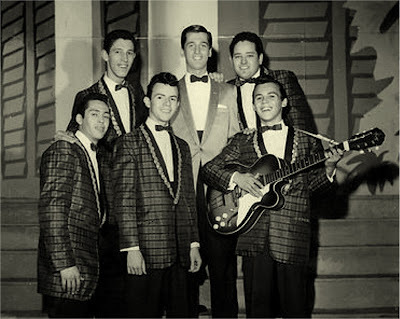 In 1958 in the section of the spanish Harlem of the Bronx five hispanic guys form a vocal group under the name of The Crystal-Chords consisted of Hector Santiago,Orlando”Lenny” Montalvo,Edward”Eddie” Sotolongo,Arnie Magraner and a Joe Paredes. They singing in the street corners and school dances a mexican folk song they adapted to the vocal group harmony sound and translate the spanish lyrics into english(but with some spanish words singing in the middle of the song). In one of these acts a musical agent heard the song and send the group to 3D Records a latin label in the bronx owened by Mildred and Victor Alonzo where they recorded the mentioned song_Be Mine Again. With Lenny Montalvo on Lead and the B Side written by the group_When In The World. with Edward Sotolongo on Lead,the group singing this side completely in english. below; the Crystal-Chords with DJ Clay Cole. The record have a big local acceptacion play in the radio(Jocko Handerson play it) but never exit of the NY. Area. 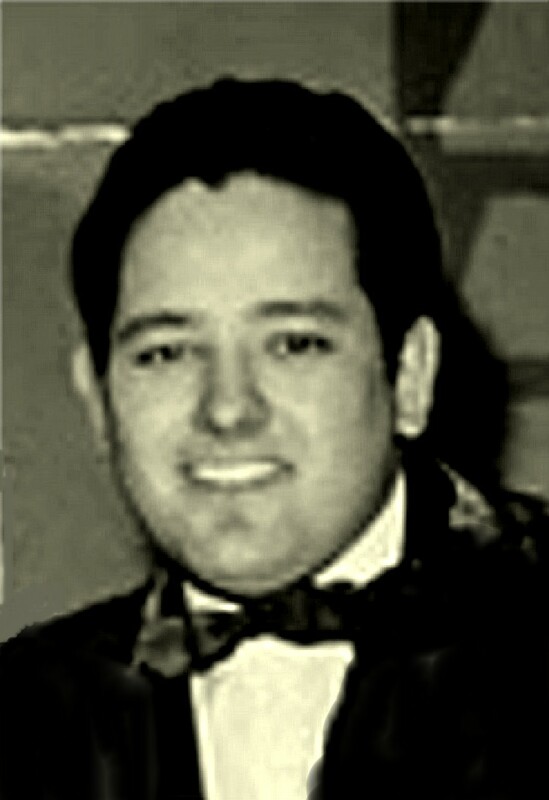 Orlando”Lenny”Montalvo died Monday,July 19,2004. he was 63. In 1958, five friends from Spanish Harlem in Manhattan (NYC) Lenny Montalvo, Eddie Sotolongo, Hector Santiago, Arnie Managrer and Joe Paredes received local attention from neighborhood teens when their record was over heard on the radio. 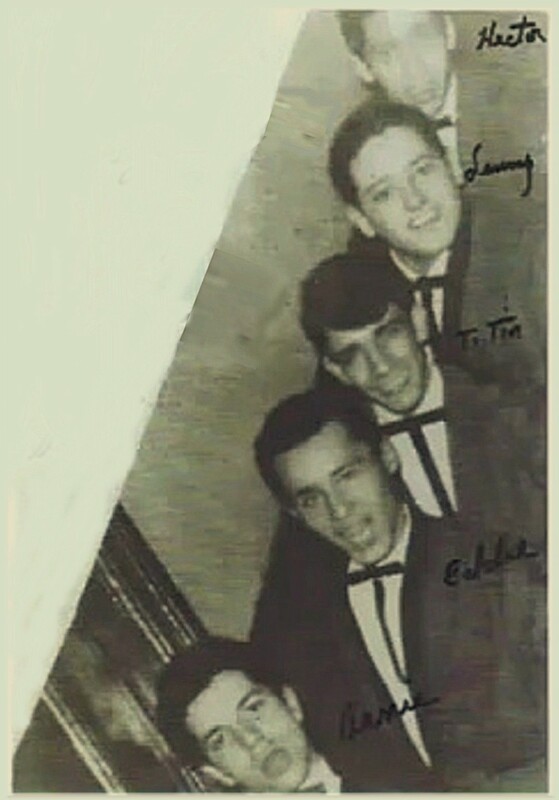 Their tune "Be Mine Again" played and earned the group local stardom and fame. The tune "Be Mine Again" was originally a Spanish Folk song. Lenny Montalvo and the guys decided to translate the Spanish lyrics into English. They also decided to have Spanish spoken words on the bridge part of the song. A music agent heard the group rehearsing it and liked what he heard. He invited the group to 3D records in the Bronx. There, the group recorded two sides for 3-D records. 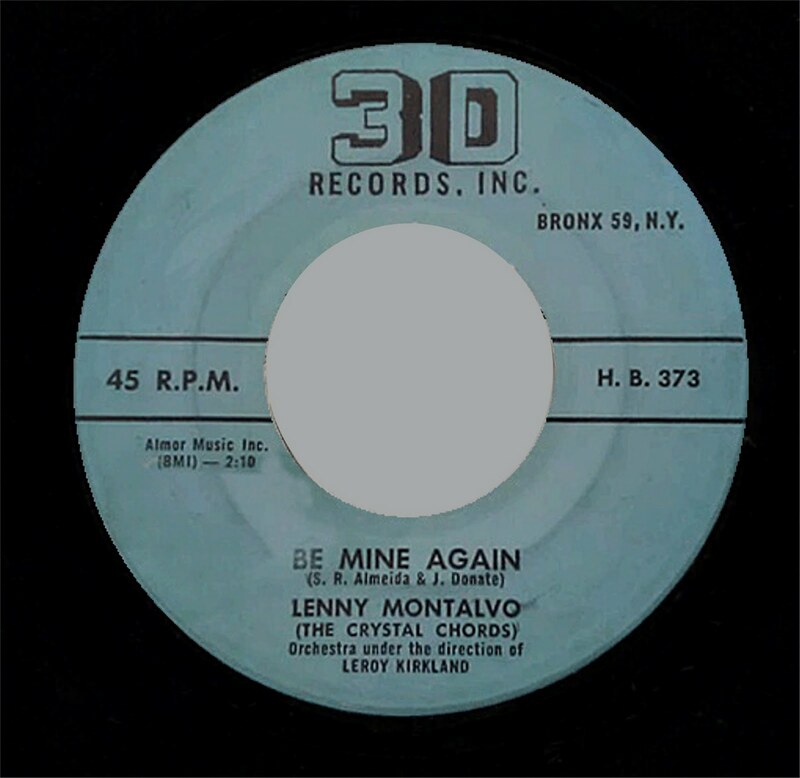 "Be Mine Again" lead by Lenny Montalvo (which became the A side) Also a tune called "Making Out" for the B side. However, because the title "Making Out" was a bit too strong and too much in those days, the label executive changed the title to "When in the World" Eddie Sotolongo sang the lead. A fellow by the name of "Titin" who really wanted to be in the group became the fill in person. He would fill in for who ever became sick or if someone couldn't make a gig. Although he posed for a group photo taken on a staircase of a tenement building, he did not record with the group. In fact, it was "Joe Paredes" who was on the 3-D group recordings. 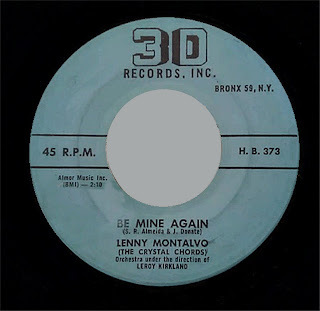 After the group disbanded, Lenny Montalvo continued singing with Hector Santiago in various other groups including The Sequins. I grew up with these guys on the corner of 105th st. in Manhattan. The photo in the hallway was taken in Eddie’s apt bldg on the corner Amsterdam Ave & 105th. Eddie lived on the top floor which they use to practice their many renditions of the great Doo Wop songs of that time. Their tight harmony rivaled the sound & richness of the great groups of note. I think they were one of the first Hispanic Doo Wopp groups at that time. They sang at The Apollo to come in second on Amateur nite in the late 50s. I think Joe Paradese (109th st.) was the alternate bass and Tito was the regular bass. Nice guys with a nice sound!